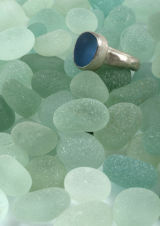 Sea-glass is man-made glass which has been smoothed and frosted by the relentless motion of the ocean. Sandblasted by the surf and tumbled as it is washed over pebbles and rocks. After decades in the sea it is transformed into gem-like treasures. I collect these jewels, or Mermaids' Tears, as they are sometimes called from the beaches of Gower and incorporate them into my handcrafted jewellery.